"T-Bone" redirects here. For other uses, see T-Bone (disambiguation). There is little agreement among experts on how large the tenderloin must be to differentiate a T-bone steak from porterhouse. The United States Department of Agriculture's Institutional Meat Purchase Specifications state that the tenderloin of a porterhouse must be at least 1.25 inches (32 mm) thick (i.e. measuring from the bone) at its widest, while that of a T-bone must be at least 0.5 inches (13 mm) wide. However, steaks with a large tenderloin are often called a "T-bone" in restaurants and steakhouses despite technically being porterhouse. In British usage, followed in the Commonwealth countries, "porterhouse" often means a British sirloin steak (i.e. US strip steak) on the bone, i.e. without the tenderloin on the other side of T-bone. However, nowadays some British on-line butchers also offer American style porterhouse steaks. In New Zealand and Australia, a Porterhouse is striploin steak off the bone. The origin of the term "porterhouse" is contentious, with several cities and establishments claiming to have coined it. The Oxford English Dictionary traces the etymology from proprietor Martin Morrison serving large T-bones in his Pearl Street (Manhattan) "Porter House" around 1814, while noting the lack of contemporary evidence to support the tale. This origin story gained traction in the late 19th century. Some sources contend a Cambridge, Massachusetts hotel and restaurant proprietor named Zachariah B. Porter lent his name to the cut of beef. In that era (late 18th to early 20th century), Porter Square was flanked by cattle yards that used the Porter rail head to transport their beef throughout the US. Still others claim the steak takes its name from various other 19th Century U.S. hotels or restaurants called Porter House, such as the Porter House Hotel in Flowery Branch, Georgia. To cut a T-bone from butchered cattle, a lumbar vertebra is sawn in half through the vertebral column. The downward prong of the 'T' is a transverse process of the vertebra, and the flesh surrounding it is the spinal muscles. The small semicircle at the top of the 'T' is half of the vertebral foramen. T-bone and porterhouse steaks are suited to fast, dry heat cooking methods, such as grilling or broiling. Since they contain a small amount of collagen relative to other cuts, longer cooking times are not necessary to tenderize the meat. The bone also conducts heat within the meat so that it cooks more evenly and prevents meat drying out and shrinking during cooking. The meat near the bone will cook more slowly than the rest of the steak, and the tenderloin will tend to reach the desired temperature before the strip. Bistecca alla fiorentina, or 'beefsteak Florentine style', consists of a T-bone traditionally sourced from either the Chianina or Maremmana breeds of cattle. A favorite of Tuscan cuisine, the steak is grilled over a wood or charcoal fire, seasoned with salt, sometimes with black pepper, and olive oil, applied immediately after the meat is retired from the heat. Thickly cut and very large, "Bistecca" are often shared between two or more persons, and traditionally served very rare, sometimes garnished with lemon wedges, if not accompanied by red wine, and accompanied by Tuscan beans as a side dish. The same cut of meat, but from a calf, is used for Cotoletta alla milanese, which consists of 1.5 cm-thick cuts which are battered in breadcrumbs and fried in clarified butter with salt. ^ "INSTITUTIONAL MEAT PURCHASE SPECIFICATIONS FRESH BEEF SERIES 100" (PDF). USDA. USDA. Retrieved 12 August 2016. ^ OED Online says "frequently supposed to derive its name from a well-known porterhouse in New York in the early 19th Century, although there is apparently no contemporary evidence to support this"
^ e.g. Zachariah B. Porter of the defunct Porter House hotel in Porter Square, Cambridge, Massachusetts "When Cattle Was King". Retrieved 2007-06-25. ; Martin Morrison of a New York City porter-house proprietor, "The Big Apple: Porterhouse Steak". Retrieved 2007-06-25. ; the Porter House Hotel of Flowery Branch, Georgia "University of Georgia Better Hometown Program "Flowery Branch"" (PDF). Retrieved 2008-04-13. ; "North Georgia Mountain Travel Association Trivia". Retrieved 2008-04-13. ^ King (Née Turner), Nicola J.; Whyte, Rosemary (2006). "Does It Look Cooked? A Review of Factors That Influence Cooked Meat Color". Journal of Food Science. 71 (4): R31–R40. CiteSeerX 10.1.1.668.6042. doi:10.1111/j.1750-3841.2006.00029.x. ^ Serious Eats (30 May 2014). "How to Grill a T-Bone Steak". Retrieved 5 March 2016. ^ Waverly Root, The Food of Italy, 1971, ISBN 0-394-72429-1. 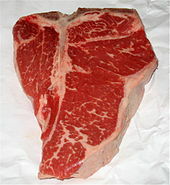 Wikimedia Commons has media related to T-bone steaks.